LIONEL WALDEN | Geringer Art, Ltd. 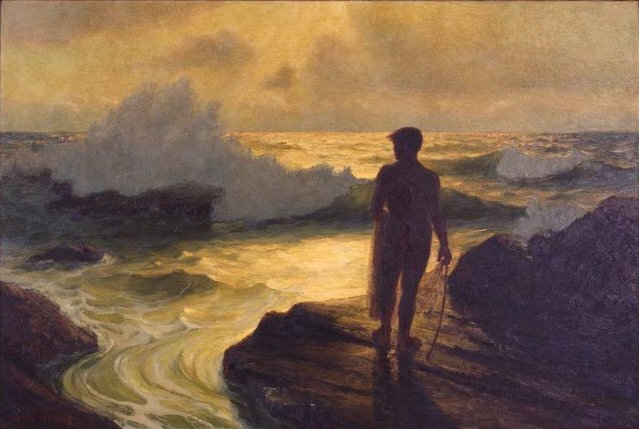 Known primarily as a maritime artist, Lionel Walden is also associated with the Hawaiian “Volcano School” and was an accomplished Neo-Classicist as well. Born in Norwich, Connecticut on May 22, 1862, he moved to Minnesota when his father became rector of an Episcopal church. As a young man, he studied in Paris with E. A. Carolus-Duran. Carolus-Duran, an academic artist who was a popular teacher — his other students included John Singer-Sargent and Henri Cross — was demanding master whose teaching emphasized precise observation and decisive paint handling. Walden began to exhibit in Paris Salons, earning the nickname “King of Bohemia” and he also exhibited and won prizes in London, St. Louis and San Francisco. He earned a Silver medal at the Paris Exposition of 1900, and a third class medal in the Salon of 1903. He won a medal for his painting “The Surf Riders” at the 1915 Panama – Pacific Exhibition in San Francisco. He was also made a Knight of the French Legion of Honor. Lionel Walden first came to Hawai’i in 1911 at the invitation of Kimo Wilder. He quickly gained a reputation for his moody, light-filled paintings of stormy seas. Among his public works were a set of dioramas of Hawaiian scenic wonders — executed in 1917 with his friend D. Howard Hitchcock — and his 1922 Neo-Classical fresco for the Hawai’i Theatre. This mural, which features a procession of classical figures playing instruments, was restored in 1996. After 1927 Walden was an active, exhibiting member of the Hawaii Society of Artists, joining a group that included Madge Tennant, Arman Manookian, D. H. Hitchcock and others. Walden’s works can be found in The Musee D’Orsay, Paris, The Brooklyn Museum, the Henry Art Gallery at the University of Washington, Seattle, and the Honolulu Academy of Arts. Walden died in Chantilly, France in 1933.